Birth control pills to regulate the abnormal cycle and bleeding. Sleeping pills for the poor sleep pattern. SSRI antidepressants for mood disturbance. Mirena IUD to stop bleeding. Endometrial ablation to reduce excess bleeding. Uterine artery embolization to reduce bleeding. All of these are common contemporary modes of treatment, but they do not treat the problem — they simply help control the symptoms of the problem, which is progesterone loss. a 14-year-old girl with PMS and irregular cycles. a 22-year-old woman with irregular bleeding, weight gain, facial hair and acne. a 38-year-old woman with heavy periods, fibroids, weight gain, dysmenorrhea and anemia. a 45-year-old woman with occasional heavy bleeding, hot flashes, migraines and anemia. a 47-year-old woman s/p hysterectomy with hot flashes, on Premarin and Effexor with weight gain, low libido, nervousness, poor sleep and migraines. a 50-year-old woman with hot flashes, occasional light bleeding, weight gain and low libido. a 53-year-old diabetic woman with minimal hot flashes, adequate vaginal moisture and no HRT. She is at high risk for endometrial carcinoma and possibly breast cancer if left untreated. a 64-year-old woman currently not taking HRT, but applies Premarin cream to her face for wrinkles. The doctor says it won’t get absorbed through the skin, so there is no risk. Yet, she has gained weight, feels bloated, has difficulty sleeping and is always exhausted. All of these are common problems. However, the last two patients might have had their problems overlooked without some physician awareness and lab work. Let’s learn some physiology and figure out how to solve these problems safely, naturally and physiologically. The lowest hormone level is prominent just before menustration begins. The falling hormones cause disruption of the blood supply to the endometrium and the tissue sloughs off. Low hormone levels are recognized by the hypothalamus and pituitary. In a healthy woman, both FSH and LH are produced. FSH levels are higher than LH. This is important. LH stimulates the ovarian theca cells to make testosterone and androstenedione. These two androgens diffuse out of the theca cells into the granulosa cells. FSH stimulates the ovarian granulosa cells to make the enzyme aromatase. It changes the testosterone into estradiol and the androstenedione into estrone. FSH stimulates the increase of its own FSH receptors in the granulosa cells. FSH stimulates the granulosa cells surrounding the growing follicles to make Inhibin B. The most prominent growing follicle has the most FSH receptors. It makes the most Inhibin B and estradiol and can grow bigger than others. Inhibin B feeds back on the pituitary to inhibit FSH. LH levels continue to rise. When estradiol and Inhibin B are high enough, LH will surge, and FSH will surge (but to a lesser degree). Only if the egg is healthy, will it launch and enable ovulation to occur. If the egg is not healthy (a common problem as women age), there will be no ovulation. Estrogen and LH levels continue to rise. After ovulation, the granulosa cells surrounding the launched egg form a Corpus Luteum. Significant amounts of progesterone are made. Remember the proportions. There will be 20 to 100 times as much progesterone in the blood as estradiol. Progesterone in circulation reaches the brain. It stimulates the production of brain opiates. This has calming effects, reduces brain stimulation from the high estrogen levels, inhibits migraines, and inhibits PMS. But most importantly, the brain opiates lower LH. If the egg is not fertilized, there is no pregnancy. After 14 days or so, the Corpus Luteum dies off and progesterone and estrogen levels fall. Hormonal support for the endometrium disappears and the period begins. IGF stands for Insulin-Like Growth Factor. The name is due to the similarity in structure to insulin. They are protein hormones of significant size. The gene that codes for their structure resides near that of insulin on the same chromosome and is similar to it. IGF-I is manufactured in large quantities by the liver and is carried in the blood by special carrier proteins, IGFBP-1-6. IGF-II is manufactured in the ovary and is the main IGF active within the ovary. The IGF proteins are intimately involved with the steroid hormones and the functions they induce and promote around the body. Insulin-like growth factors promote cellular mitosis and differentiation. They are an intermediary between estrogen and progesterone and the effects they have in multiple locations around the body. IGF-I is involved in estrogen’s effects on growth within the endometrium. IGF-II is involved in the differentiation in response to progesterone. IGF-I is the primary regulator of myometrial growth in response to estrogen. Why so many IGF binding proteins? Within cells, the various binding proteins act as regulators controlling the functions that the steroid hormones stimulate. In the serum, IGF-I is mostly carried by IGFBP-1. Most of the IGF-I in the blood is bound to the carrier protein. Within the cell, IGF-I and IGF-II bind to special receptors. IGF-II, the main IGF within the ovary, binds to both its own IGF-II receptor and also the IGF-I receptor. Outside of the ovary, IGF-I is mostly active and binds to the IGF-I receptor. The activity level of the IGF hormones, regulated by their carrier proteins, is central to the actions of the steroid hormones, estrogen and progesterone, and the levels of the hormones themselves. The multitude of actions from the steroids around the body happen through the intermediary actions of the IGF proteins. Why do I need to know about IGF proteins? The biggest issue is their similarity to insulin. Insulin has the ability to bind to the IGF-I receptor. For the most part, insulin is free in the serum. Insulin resistance, high intake of sugar and insulin use by diabetics, all increase insulin in the blood. Here is the link between insulin resistance and abnormal cycles in PCOS: Insulin, especially in excess quantities, will bind to IGF-I receptors and promote estrogen effects throughout the body. Under Patient Work-Up, I provide a couple of articles regarding normal laboratory values of various hormones. Here is a more central question: In the balance between estrogen and progesterone, what is considered normal? When oral contraceptives were invented, the twenty-one day on and seven day off pattern was chosen to mimic the twenty-eight day menstrual cycle. In fact, this was fairly arbitrary. Speroff has a nice review of the developers of The Pill. One had the hope of receiving official Catholic Church approval if it reproduced the twenty-eight day cycle. That didn’t happen. In fact, over the course of history, few women spent their lives having periods. Most women were pregnant from an early age — pregnancy generates high estrogen levels that are dominated by estriol and progesterone. It is primarily a progesterone dominant state. Pregnancy was followed by a year or more of breast-feeding; a low estrogen state. After a few cycles, a new pregnancy began. Normal was a few months of periods followed by pregnancy and breast-feeding. With a significantly lower death rate among children along with new medical technology, the late 20th century ushered in the era of family planning. Most women now spend their lives with pregnancy and breast-feeding as a rare event. Birth control pills are progestin dominant. As women age, they are constantly losing eggs. The eggs that remain are less likely to function properly. Fertility rates peak in the early twenties and slowly decline until age thirty-five. After age thirty-five, the decline in fertility is more rapid. Declining fertility is just a reflection of lower ovulation rates as well as poor egg quality and lower progesterone levels. Estrogen, however, is not declining at this time. Lets go back to the review of the menstrual cycle above. As the egg matures, the granulosa cells in the ovary produce Inhibin B. This hormone feeds back on the hypothalamus-pituitary to suppress FSH production. With fewer viable eggs, Inhibin B production goes down. This means that FSH will not be as well suppressed. For women in their late 30's and 40's, the granulosa cells work just fine. FSH is rising because of reduced production of Inhibin B, not because of lower estrogen. If you measure estrogen levels on women with slightly elevated FSH, you will find that estradiol and estrone levels are frequently quite high. High estrogen levels will overstimulate the endometrium and will grow thicker and thicker. Eventually, it will start to come apart and cause irregular, heavy bleeding. If there are fibroids, they will grow. Restore a normal bleeding pattern. Increase the chances of a normal ovulatory cycle. Estrogen and progesterone live in a push-pull balance in many areas of a woman’s body. Many of the roles of testosterone in men are expressed in women with progesterone. The receptors for testosterone, progesterone and cortisol are all very similar and all three hormones can attach to any of the three receptors. In many tissues, testosterone and progesterone have similar stimulatory effects, while cortisol has a down regulating effect. This is true of the osteoblast cells in the bone, of muscle production and thyroid. Men make testosterone on a constant basis. A young man’s testosterone level is approximately two hundred and fifty times his estradiol level. A man in his fifties still has testosterone approximately one hundred times his estradiol, unless he has excess abdominal fat or poor liver function. This means his estrogen levels will rise and upset the balance. For women, progesterone is only present during pregnancy and in the second half of the menstrual cycle. Progesterone levels range from twenty to one hundred times those of estradiol during the normal cycle. 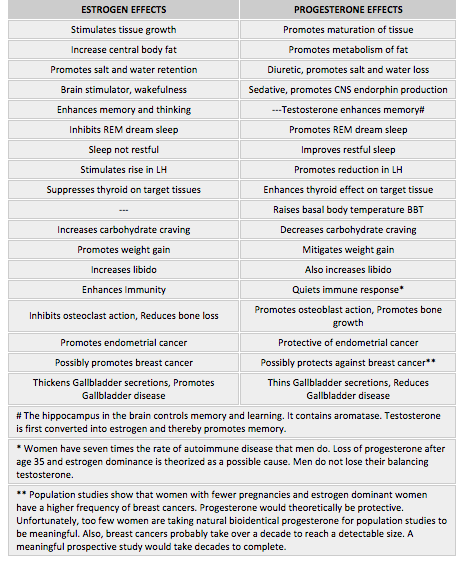 Balancing differences between estrogen and progesterone. So, what would this estrogen dominance state look like? We see these women every day. As women age beyond thirty-five, ovulation becomes less frequent. If they don’t ovulate for a few months in a row, LH becomes persistently high. This induces a chronic state of elevated intra-ovarian androgens, which inhibit ovulation. The situation becomes self-perpetuating. Excess estrogen causes increased carbohydrate craving. Because of this, the patient starts to gain weight, especially around the waistline. Intra-abdominal fat has the ability to make the enzyme aromatase. Aromatase will convert adrenal produced testosterone and androstenedione into estradiol and estrone. This drives estrogen excess even higher, increasing and speeding up the process — we have a positive feedback circuit. All of this estrogen promotes the growth of the endometrium and that growth is continuous. It is not mitigated by progesterone. Eventually, heavy bleeding will come at irregular intervals. The estrogen will also promote the growth of fibroids and polyps. Even if there is a growing egg, if it is defective (a more common occurrence with age), it will not ovulate. With the extra FSH around, the follicle will grow into a follicular cyst. If anovulation is chronic, the rising LH will cause extra intra-ovarian testosterone and androstenedione. That inhibits the maturation of follicles. The stimulated follicles don’t die off as easily either, a process called apoptosis. We get a bunch of follicles frozen in an intermediate state of neither growth nor apoptosis. These strings of small follicles form the typical appearance of the PCOS ovary. Were you wondering why I brought up IGF and insulin earlier? Well, here it comes. With weight gain comes increased insulin resistance. These women crave carbohydrates such as eating a lot of bread and sweets. Some are drinking those dainty 32 oz. soft drinks that come with Value Meal #1. Today’s soft drinks are sweetened with high fructose corn syrup, pure, monosaccharide glucose. It is very rapidly absorbed and drives blood glucose levels up. This is followed by a rapid rise in insulin. The insulin drives the sugar into the abdominal fat, causing an increase in central obesity. This is a second positive feedback circuit. Remember, insulin and IGF are very similar in size and shape. Insulin fits on the IGF-I receptor. Insulin stimulates the receptor just as if it were IGF-I. With all of that extra insulin around, the target tissues think there is a lot of estrogen driving IGF-I activity. So, the target tissue does the same thing it would do if there were a lot of estrogen. In the endometrium, this means growing thicker and heavier bleeding. In the myometrium, this stimulates fibroids to grow bigger and endometrial polyps to grow. In the breast, this stimulates ducts and glands to proliferate, but not to differentiate. Women with insulin resistance have elevated rates of breast cancer. In the ovaries, follicular cysts are increased. This is our third positive feedback circuit in these women. Giving Metformin may help, but a reduction in carbohydrate and total calorie intake is essential. Growth of fibroids, endometrial polyps and ovarian cysts. Weight gain, especially central weight gain (apple shaped). Poor sleep pattern with depression caused by sleep depravation. Increased risk of endometrial cancer. a 14-year-old girl with PMS and irregular cycles: At this age, she may not have a regular hypothalamic-pituitary axis. The ovary simply responds to the stimulating hormones it sees. Without normal LH and FSH surges, luteal phases tend to be ineffective and progesterone is often inadequate. If she is not sexually active and doesn’t need contraception, progesterone cyclic therapy can work wonders with little or no side effects. a 22-year-old woman with irregular bleeding, weight gain, facial hair and acne: This is the typical PCOS patient. If she needs contraception, a low dose birth control pill is a good option. I see many women who are in their thirties and forties, have completed their families, but are still suffering with the side effects of PCOS. Progesterone cycling alone will help many of these women. Others will require special attention to hirsutism, acne or insulin resistance issues. a 38-year-old woman with very heavy periods, fibroids, weight gain, dysmenorrhea and anemia: These women respond beautifully to progesterone when given in a cyclic fashion. Their only problem is an aging ovary with aging eggs. The positive feedback nature of estrogen dominance often spins them out of control. It is my belief that if these pre-menopausal women were treated with cyclic progesterone, the hysterectomy rate in the U.S. could be reduced by 70-80%. Endometrial ablation is performed on women with a normal or nearly normal size uterus. Their problems are hormonal, not uterine. It's been over three years since I had to perform an endometrial ablation. It is possible that I failed to control bleeding problems with some patients. If they sought help from another physician, I am not aware of it. Until this writing, I have gotten bleeding under control and prevented further anemia in all of these patients. This applies to women with large fibroids who sought treatment because they absolutely refused surgery. Of course, if cancer is suspected, that must be dealt with appropriately. a 45-year-old woman with occasional extreme heavy bleeding, hot flashes, migraines and anemia: This is the typical pre-menopausal woman. She may have mildly elevated FSH but it is accompanied by a significant level of estradiol or estrone. Many of these women have high estrone, which may not be obvious, if only estradiol was measured. Some women at this age are fully menopausal. If FSH is the only hormone measured, this woman would be falsely labeled as menopausal and treatment would not be ideal. These women respond beautifully to progesterone. Periods straighten out, hot flashes stop, migraines are reduced or stop all together and anemia is no longer a problem. Sleep is improved and that helps all of life. a 47-year-old woman s/p hysterectomy with hot flashes on Premarin and Effexor with weight gain, low libido, nervousness, poor sleep and migraines: Without a uterus, there is no bleeding. The only way to assess ovarian output is with hormone measurement. Many physicians measure only FSH. Just because FSH is elevated does not mean the patient is low on estrogen. Giving additional estrogen to a woman who is already estrogen dominant will only make her worse. I see many of these women. The constant high estrogen produces the weight gain. Insomnia and chronic sleep depravation without good REM sleep leads to nervousness and depression. It reminds me of my first year of OB residency. Sleep depravation is a terrible thing. Simply giving progesterone and restoring balance works wonders. Many of the women spontaneously stopped the SSRI antidepressants once a normal sleep pattern was restored — they didn’t need them anymore. Of course, if they are still producing estrogen, they will not need estrogen supplements. a 50-year-old woman with hot flashes, occasional light bleeding, weight gain and low libido: This woman may still be making a small amount of estrogen. Although her estrogen levels are low, without any progesterone, she still has some symptoms of estrogen dominance. She may need both estrogen and progesterone. Since menopause is recent, I would cycle the progesterone to check on withdrawal bleeding. Endometrial surveillance is still appropriate as needed to rule out hyperplasia or carcinoma. Progesterone therapy will usually resolve low-grade endometrial hyperplasia.